Environmental assessments (EAs) involve multi-disciplinary team processes, which demand scientific, technical, socio-economic, and communication expertise. In Canada, EAs have had a long history and are shaped by market, regulatory, social and technological factors. In this report, ECO Canada examines key roles and required skill sets in the Canadian workforce. 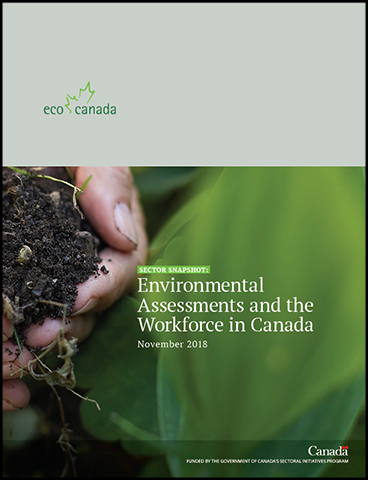 At the same time, an overview of federal EA legislation and regulatory trends is presented to analyze how proposed changes to the environmental assessment framework could impact the way projects are conducted, and how EA practitioners would expand their knowledge to comply with new requirements. Four major stakeholder groups are directly involved and/or impacted by the EA process: project proponents, consultants, regulatory bodies and interested stakeholders. Environmental consulting service firms have generated close to $840 million in revenues for EAs. An estimated of $260 million in salaries were distributed by those companies among 4,000 full time equivalent employees. Demand for knowledge and experience from anthropologists, archeologists, historians, social scientists and other related occupations are expected to increase for certain aspects of the evolving EA process. There is a strong and urgent need for inter-organizational collaboration to communicate relevant knowledge and expertise related to environmental assessment.